. With this update, you can now delegate the administration of the Calendar Resources section (useful for facility managers) or the Calendar Settings section as a whole, simply by assigning the new ‘Calendar Resources’ or ‘Calendar‘ privileges to delegate admins. 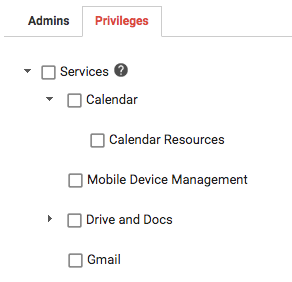 Today, we’re providing G Suite Super Admins additional control over how they grant access to the Calendar Settings section of Admin console, with the addition of ‘Calendar’ and ‘Calendar Resources’ administrator privileges. Super admins can delegate the management of certain Admin console sections, by assigning system or custom administrator roles to their users. With this update, you can now delegate the administration of the Calendar Resources section (useful for facility managers) or the Calendar Settings section as a whole, simply by assigning the new ‘Calendar Resources’ or ‘Calendar‘ privileges to delegate admins.